Excel Accounting Training provides continued professional education (CPE) for certified public accountants (CPA) and accounting professionals. The comprehensive training content is available as both paperback book format and interactive online courses. Accounting training is self-paced and covers and range of basic to advanced Excel topics with emphasis on tasks required in accounting work and by professional accountants. Course content is based on years of accounting experience to specifically target learning for productivity efficiency on accounting based tasks. Training materials are provided in multiple formats to facilitate learning including videos, PDF files and Excel workbooks. 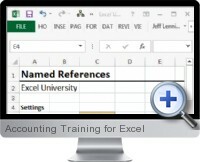 Self-paced training through a variety of download formats and support materials suits flexible training needs and can be leveraged when conducting actual accounting work in Excel. Interactive courses draw on live help and discussions as well as forums and blogs to answer questions for particular user case scenarios. Course handouts include materials for offline reference and learning with all content available after courses have ended. Optional paperback book versions of the courses can be purchased and official certificates of course completion are issued for proof of competencies gained.